Over 60 civil Model 204B helicopters had been delivered by 1967, while further examples were built by Agusta-Bell until 1973. 12,000 Model 205s (including civil 205A-1s) were built by Bell and Agusta-Bell up to the early 1980s. Numerous ex-military 204s and 205s were converted for commercial use. Bell 204B – Civil or military utility transport helicopter, derived from the UH-1B. Powered by a T53-09A, max weight was 8,500 lbs, max passengers, ten. Agusta-Bell AB 204 – Civil or military utility transport helicopter. Built under licence in Italy by Agusta. Fuji-Bell 204B-2 – Civil or military utility transport helicopter. Built under licence in Japan by Fuji Heavy Industries. Used by the Japan Ground Self Defense Force under the name Hiyodori. Bell 205A – Civil or military utility transport helicopter. Powered by one T53-11A, max weight 8,500 pounds, max passenger, 14. Agusta-Bell 205 – Civil or military utility transport helicopter. Built under licence in Italy by Agusta. Bell 205A-1 – Civil or military utility transport helicopter version, initial version based on the UH-1H. Powered by one T53-13A, max weight 9,500 pounds (10,500 for external loads), max passengers, 14. Agusta-Bell 205A-1 – Modified version of the AB 205. Fuji-Bell 205A-1 – Civil or military utility transport helicopter. Built under licence in Japan by Fuji. Bell 205B – Bell's early version of the 210 built in the late 1970s; only five were built and sold. Had 212 nose, uprated T53-17 engine, K-Flex driveshaft, 212 main rotor blades, tail rotor blades. Max weight, 10,500 pounds (11,200 external), max passengers, 14. Bell 210 – Bell Helicopter's designation for a UH-1H, remanufactured and sold as a new aircraft. Powered by one T53-17B, same weight capacities as the 205B. Agusta-Bell 205BG – Prototype fitted with two Gnome H 1200 turboshaft engines. Agusta-Bell 205TA – Prototype fitted with two Turbomeca Astazous turboshaft engines. 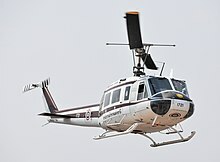 Bell 208 – In 1965, Bell experimented with a single twin-engine Model 208 "Twin Huey" prototype, which was a UH-1D fitted with Continental XT67-T-1 twin-pack engine module, consisting of two power turbines driving a common gearbox. This exercise was performed as an experiment using company funds. 205A-1++ – Field-upgraded 205A utilizing a T53-17 engine and a 212 drivetrain. Similar to the production 205B and 210. Advanced 205B – Proposed upgraded Japanese version. Global Eagle – Pratt & Whitney Canada name for a modified UH-1H with a new PT6C-67D engine, modified tail rotor, and other minor changes reported to increase range and fuel efficiency over the Bell 212. Huey 800 – Upgraded commercial version, fitted with an LHTEC T800 turboshaft engine. 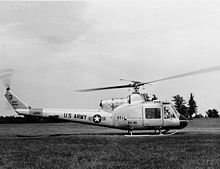 Bell 211 – The HueyTug, was a commercial version of the UH-1C with an upgraded transmission, longer main rotor, larger tailboom, strengthened fuselage, stability augmentation system, and a 2,650 shp (1,976 kW) T55-L-7 turboshaft engine. Bell 212 – Bell Helicopter's company designation for the UH-1N. Bell 214 Huey Plus – Strengthened development of the Bell 205 airframe with a larger engine; optimized for "hot and high" conditions. Later developed into the larger, twin-engine Bell 214ST. Bell 412 – Bell 212 with a four-blade semi-rigid rotor system. Panha Shabaviz 2-75 – is an Iranian utility helicopter built by the Iranian Helicopter Support and Renewal Company. It is a reverse engineered version of the Bell 205s which were sold to the government of Mohammad Reza Pahlavi. The first example was built in 1998 and the type was publicly unveiled the following year. It has been manufactured locally in Iran since 2002 and is in active service with the Iranian military and government. It has also been claimed that it can be modified to carry light weaponry. ^ Douglas W. Nelms (2005-11-01). "Eagle Power". Aviation Today. Archived from the original on 2007-11-14. Retrieved 2007-03-17. ^ "Skycranes". Centennial of Flight Commission. Archived from the original on 9 April 2007. Retrieved 2007-03-15. ^ a b Panha hovers between repair and manufacturing. ^ "Research aircraft (rotary and fixed wing) – National Research Council Canada". Nrc-cnrc.gc.ca. Retrieved 2014-04-22. ^ "ROYAL THAI POLICE -History" (PDF). Retrieved 17 January 2013. ^ "Royal Thai Police Wing". JetPhotos.Net. Archived from the original on 22 December 2015. Retrieved 17 January 2013. ^ "National Airborne Service Corps (NASC)". TaiwanAirPower. Retrieved 18 Jan 2013. 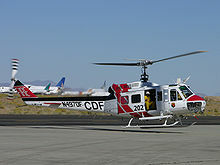 ^ "CAL FIRE Air Unit". Retrieved 20 January 2013. ^ "Florida Department of Agriculture and Consumer Services". ffs.gov. Retrieved 17 January 2013. ^ "Heuy dust off". Network Solutions®. Retrieved 22 January 2013. ^ "LVMPD Air Support". Archived from the original on 15 January 2013. Retrieved 20 January 2013. ^ "NASA Security". Retrieved 20 January 2013. ^ "OC Fire Authority". Copyright ©DPD. Retrieved 17 January 2013. ^ "SBSD Aircraft operated". sbcounty.gov. Retrieved 17 January 2013. ^ "San Diego Sheriff's Copter 10 Responds To Riverside County For Hoist Rescue". Police Helicopter Pilot.com. Retrieved 17 January 2013. ^ "San Diego County Sheriff Bell 205A". Demand media. Retrieved 17 January 2013. ^ "Southwest Border Region". CPB.gov. Archived from the original on 24 March 2014. Retrieved 17 January 2013. ^ "US Customs & Border Protection UH-1H". Demand media. Retrieved 17 January 2013. ^ "Ventura County Air Unit". Retrieved 20 January 2013. ^ "Kittitas County prepares for wildfire season". dailyrecordnews.com. Retrieved 17 January 2013.